Asparagus is an early summer vegetable. After roasting asparagus, you should just season it with kombu soy sauce. you should just season it with kombu soy sauce. Even though the simple process, this dish is full of fresh flavor. The ingredients are asparagus, salt, pepper, kombu soy sauce. Wash the asparagus and slice off the hard parts of asparagus. Cut the asparagus into halves. Cut the lower part in half vertically. 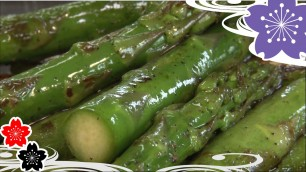 Heat a little olive oil in a frying pan and roast the asparagus. add the salt and pepper or some spices (if you have it). After that, pour kombu soy sauce* evenly. however the Japanese soy sauce brings out the fresh flavor of the vegetable. *How to make "kombu soy sauce"
Cut the "kombu for making soup stocks" into rectangles. And put them in a container and pour 200cc of soy sauce there. It is done after soaking for 2-3 days. The kombu soy sauce is good with "hiya yakko"
(cold tofu, blocks of tofu served cold) and Sashimi. When you stock them, it will be convenient to use.